Dr. Aldrich graduated from the University of Illinois College of Veterinary Medicine. He has been in practice in New Haven for 40 years. He was one of the founding members of The New Haven Central Hospital for Veterinary Medicine. The Hospital was only the second of its kind in the United States to provide 24 hour care for its patients. Dr. Aldrich is a member of the American Veterinary Medical Association, the American Association of Feline Practitioners, and he is Past President of the New Haven County Veterinary Medical Association. He is also a member of the service club Kiwanis. Dr. Aldrich is married to Janet, and they have 2 grown children and 3 grandchildren. Their pet at home is a Labrador retriever named Finn. He has qualified as a therapy dog, and Dr. Bob visits children in the hospital with him. Dr. Bob is working part time now. Rachel has worked at the office for over five years. She has been in practice in the New Haven area for several years. She graduated from the University of Pennsylvania Veterinary School in 2002. Her special interests include internal medicine, alternative medicine, and nutrition. She is married with two young boys. At home she has two Sphynx cats and a dog named Wuzzy. Rachel usually sees patients Thursday and Friday. She is also here every other Saturday. Diana Weston earned her DVM from Oregon State University in 1991. She came to Connecticut to do an internship at Central Hospital. 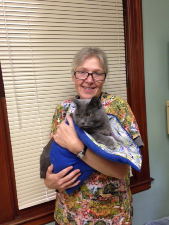 She stayed in CT and raised a Family of 3 while practicing Veterinary medicine for the past 25 years. She has worked as both an emergency veterinarian and a relief veterinarian during this time and loves helping her patients and their people. She is happy to be joining the Westville clinic on a regular basis. Some of her interests outside of vet medicine Include family time, being outdoors, Taekwondo, and word games. She will be seeing appointments on Mondays and Tuesdays.